A new and promising stereo-3D educational content producer started exhibiting their wares in the U.S. this summer: e-Animations. Based in Hungary, this company has a lot to offer, including exceptional artistry and reasonable pricing. You can preview some of their animations (in 2D) here on VIMEO. XPAND leaders were in the aisles and byways at most conferences this summer, visiting various booths and some of my presentation sessions. 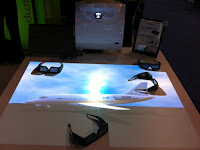 They were also showing (in one-off settings) their latest active glasses for the education market, the EDUX 3 series. These new glasses offer a TN lens (clearer, with no green tint), CR2032 replaceable batteries (which can be purchased from any store), folding arms (for better storage and fit), and an on-off switch. 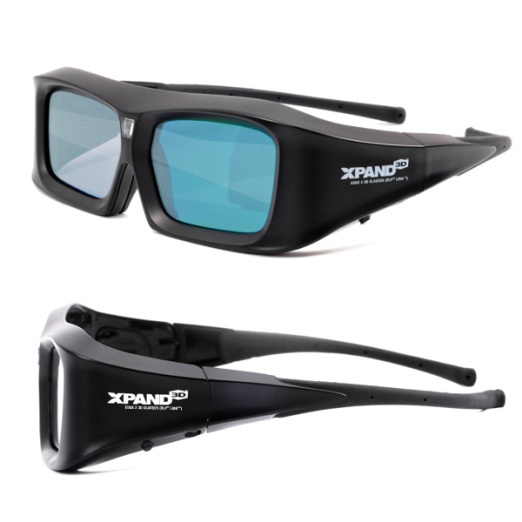 Distances for viewing and durability remain a high plus for these glasses, and the price has been lowered significantly from last year. I expect XPAND to remain strong in the education market with their continuing commitment to continuous improvement and price reduction. Do you have a new product for the education market or are you updating a previous product? Do you have an interesting story to tell? If so, please contact me for an interview. Gold panning takes patience. A gold panner looks for placer deposits, fills the bottom of his/her favorite pan with anticipation, and then meticulously manipulates the pan to filter gold from the heavies and black silt that layer the dark bottom ridges of the gold pan. It’s not easy work, but it can be rewarding, given the staggering price of today's gold. Gold panning for great technology is no different. During difficult financial times, it’s not easy to find real nuggets, those bold counterstrokes of innovation and potential that can produce glimmers of hope in a tough market. In the next three consecutive posts, I'll highlight a few of the new 3D-related products that bounced across my preternatural radar this summer. Here's the first revelation, and it's quite interesting: Optoma offered a wonderful idea this summer. They showed how to use an ultra-short throw DLP 3D projector, along with interactivity, to create a unique interactive tabletop display surface. For a live demonstration, see this video. It’s basically an interactive whiteboard, with 2D or 3D, on any tabletop surface. This makes a lot of sense for schools, learning centers, museums, and other spaces that like to conduct smaller, more personalized tabletop simulations or exercises. It even makes sense for school and emergency preparedness training for small group training. I expect this approach to really resonate with educators. Think about how you might apply this idea in your own setting. Grasping for words. In search of just-the-right language. Looking for richer metaphors. These best describe what has been occupying my think time in recent months. You see, the expression ‘3D’ carries a lot of unwanted baggage. For most, the expression ‘3D’ conjures to their minds little more than movies—‘pokey’ entertainment. Some people immediately associate the term ‘3D’ with architectural drawings (CAD), Google Earth, gaming, or other types of “rendered 3D” objects or scenescapes. Then there’s a well-known film critic, who speaks for many, in suggesting that “‘3D—it just makes me sick.” (He was unaware of the research findings that indicate his discomfort is caused by underlying vision issues, which are easily addressable. But that’s another story.) For many others, ‘3D’ is simply not a part of their generation and therefore not on their radar. Teaching and learning with DEPTH is a pleasant way to describe how we use 3D in educational settings. It’s an expression that is, at once, both hopeful and free of the past, largely unwarranted, baggage. So far, it seems to resonate well with educators and educational conference leaders. Do you have any similar musings? Other ways to word the notion of the 3D experience? Please post them as a comment below. FutureTalk 3D has been doing very well, thanks to your committed involvement as readers. Thank you so very much! This blog is now reaching 2,300 web impressions a month, with our readers coming from nearly every country in the world. That’s quite exciting for a blog dedicated solely to the emerging role that 3D is playing in all spheres of the educational enterprise (including K-12, university, optometric, medical, industry, and even patient, customer, and sales force education). And just so you know- so that you don’t get confused—we are expanding the FutureTalk concept to incorporate a new blog called FutureTalk VIZ. This new blog has the same moniker—FutureTalk—but is not focused on 3D. It is instead dedicated to the world of classroom visualizers or document cameras. I recently published Digital Shapeshifter, the leading resource on creative teaching with classroom document cameras, and this new blog will become a living extension of that book. (Of course, the book does contain a few sections on the topic of stereo 3D visualization with document cameras.) FutureTalk VIZ is merely a new “startup,” a new blog operating in its own sphere of influence within the FutureTalk brand. On the other hand, FutureTalk 3D will continue its 3D-in-learning emphasis, with many exciting, ground-breaking, and even controversial topics looming on the horizon. Stay tuned.